496a, HUBCAP USED, 14", 96, DODGE, NEON, SPARKLE SILVER, 5 LARGE HOLES. 5 FAKE LUG NUTS, NO LOGO, 5 SETS OF PLASTIC CLIPS & WIRE RING. 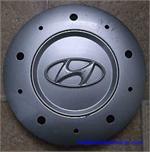 70700, CENTER CAP USED, 16", 03-04, HYUNDAI, Tiburon, SPARKLE SILVER, WITH 5 LARGE HOLES & 5 SMALLER HOLES & RAISED LOGO, 6-1/2" DIA.